I had to laugh this morning while walking from the car into Somerset Mall. I heard a crow having a good old squawk; looked around to locate it and you guessed it. It was sitting on the roof above Pick n Pay, right next to one of those shiny, whirly pyramid things that are apparently meant to keep birds away. So it seems they may not work quite as well as advertised. As mentioned in my previous post I contacted Sony asking about a simple memory upgrade voiding the warranty. Here’s what I said to them. I purchased a Vaio VGN-NW23GE notebook from the Somerset Mall branch of Dion Wired today and asked that an additional 2GB of RAM be added to the standard 2GB. I was told that this could not be done for Sony Vaio machines without invalidating the warranty, and was given a name and number of someone at Rectron that would be able to arrange the upgrade for me. I thought this a little strange and on getting home and starting the machine I noted that the hardware manual contains a section explaining how to add and remove memory. As this procedure is explained in the user manual it seems unlikely that doing so would void the warranty. You may wish to look into the reason for your retailers having this seemingly incorrect information. I would be most interested to receive feedback on what you find out. To their credit they replied with the following. Thank you for contacting SONY South Africa. I am happy to assist you with the memory upgrade query. When upgrading any of VAIO electrical components it is highly advisable to send in the machine to the authorized service center, this ensures that the upgrade performed is according to the service guide precaution and standards. Unfortunately the response has been truncated, probably by a web based contact system (I had submitted my question via a contact form on their web site). It seems that the act of upgrading the memory alone will not void the warranty but that Sony may refuse to honour the warranty if it is obvious that failure is due to incorrect memory being installed or that damage was caused by the person installing the memory. Dion Wired have probably chosen not to allow their staff to do any work on Sony products to prevent any warranty claim issues from arising as their in-store technical facilities are must not be Sony authorised service centres. Despite my statement that I would think twice before shopping at Dion Wired again, yesterday saw me there again making a fairly large purchase. As you’ve probably guessed from the title and image, I’ve finally succumbed and bought myself a laptop. I got a fairly well specified, fast but not super fast Sony Vaio VGN-NW23GE in black, as pictured. I don’t intend using this as a development machine and will be using it for downloading and processing photographs when I’m away from my desktop machine and for giving me the ability to access the internet when away from home or the office. It will also be great to have access to Google and IMDB while watching movies and TV shows to answer those weird questions that always come to mind. It will also allow me to attend photography workshops; something the lack of a laptop precluded before. Unlike my previous experience I received great service from Keanon (hope I’m spelling it right) at the Somerset Mall branch, who gave me good advice that allowed me to save R2,000 by buying a slightly lower specified machine than the one I first considered. He also threw in a R300 laptop bag as a freebie. One curious thing though is what happened when I asked if they could upgrade the machine by adding an additional 2GB of RAM to double the memory. I was originally told this would be no problem. However, after checking with someone, presumably the techies that do upgrades and repairs, Keanon said they couldn’t do it. Seemingly they can for any laptop other than Sony ones, where doing so would void the warranty. Considering that memory upgrades are a common practice and that the hardware user manual contains a section explaining how to add and remove memory, I fail to see how their doing so would invalidate the warranty. Anyway, Keanon gave me the name and number of someone at distributors Rectron, that I can contact to arrange the RAM upgrade. I have e-mailed Sony, via the contact page on their site and am awaiting feedback from them on whether there is any truth to the warranty voiding story or not. 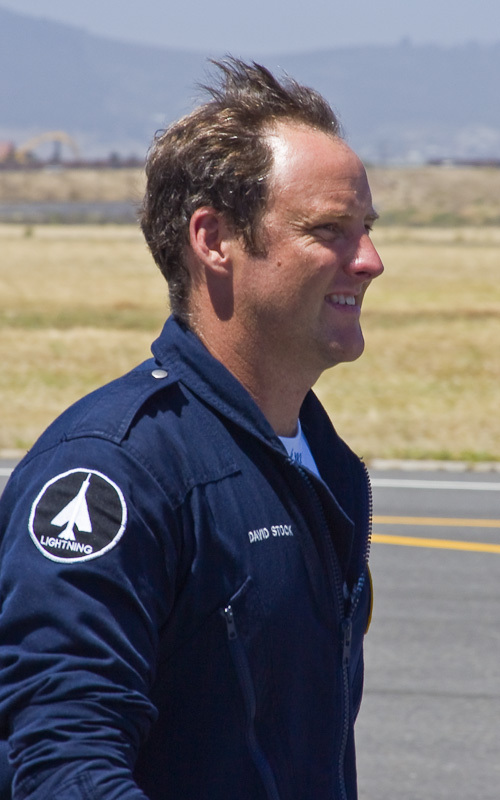 Dave Stock died in a crash at AFB Overberg on 14 November 2009 while doing what he loved, flying the English Electric Lightning. He will be missed, not only by family and friends, but by thousands of air show fans like myself; who were entertained by his marvellous displays over the years. This photograph was taken at AFB Ysterplaat on 3 December 2005, shortly after Dave and the Lightning had set a new African time to altitude record. I believe this record still stands. False advertising from Dion Wired? As I’m going to an air show on Saturday I ordered a larger memory card for my camera from an online retailer last week. It should have been delivered today but instead I received a phone call apologising for a supplier delay. As I will only receive the card next week I started looking around at local stores to buy a card before the show. 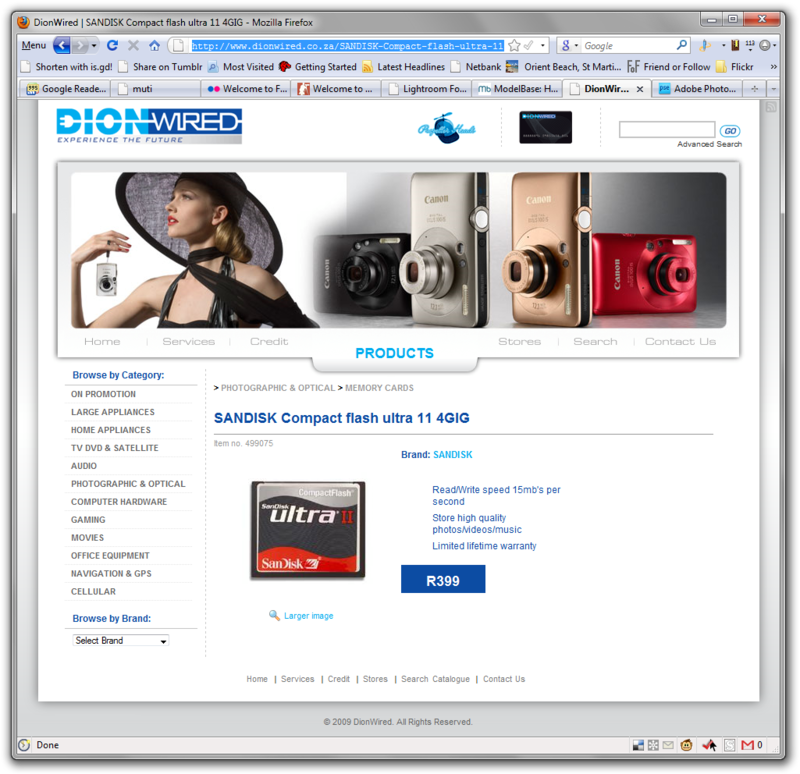 There’s a new Dion Wired store in Somerset Mall so I took a look at their web site and spotted a 4GB SanDisk Ultra II card for R399 and decided that’s what I would buy. I understand that mistakes can be made and web sites may get out of debt but in cases such as this I would at the very least expect to be offered the product at the lower, advertised price. Their failure to make such an offer smacks of false advertising, intended simply to get you into the store where you may be willing to capitulate and pay the higher price. I am not prepared to do so and would rather take my business to a smaller store where I may have to pay that little more but where I can expect good service and will know that I am not being cheated. I will certainly think twice before considering Dion Wired as a potential shopping venue in the future. I’ve always thought of Incredible Connection as being a reasonable place to buy tech stuff. But two purchases I’ve made in the last week reveal that they are actually a rather expensive option when compared to other stores. I’ve been needing an ink cartridge for a while now and was prompted to action by an e-mail newsletter from Digital Planet offering a special on the very cartridge I needed. After failing to find the product for a comparative price on Incredible Connection’s web site I went ahead and ordered it from Digital Planet as they had stock and could offer twenty-four hour delivery. Including a R60 courier fee the cost came to R270. On Saturday morning I was in Somerset Mall, popped into Incredible Connection and found that their price would have been R299.95. A little later we were in PNA where my wife was buying some pens. I noticed that they had 8GB Verbatim USB sticks in stock and on finding they were R234, which I thought a good price, I bought one. On our way out of the mall I again stopped by Incredible Connection and found their price for the same USB stick was again R299.95. My wife suggested that Incredible Connection might be cutting costs by reducing the different price labels they need to print. Clearly Incredible Connection are not the cheap option for tech items that I thought, so if you’re looking for such items I suggest you do some comparative shopping first so as not to find out that you paid a premium by buying from Incredible Connection. I have had a busy few days at work without much time to keep up with reading feeds, so I’m sitting here catching up on the feeds that have built up during the week. I saw Jeff Revell’s mention that the gallery for the walk he led was up on the official page so I went to check the page of the walk I took part in. Sure enough the photos were up and I scanned the thumbnails to see what was there and check that my submissions had made it. It was only when I reached my own images, the last two, that I thought “Hey, one of those images doesn’t look right.” It took me a moment to realise what the cause was; the thumbnail was square and my images have the standard DSLR 3:2 aspect ratio. As the images below show, one of them is a minimalist photo that doesn’t lose much when cropped to a square, but the other one loses a lot. In the case of the photo walk galleries, these are not clickable thumbnails but I have seen other sites do this and it concerns me that sites would use thumbnails that crop significant information from photographs. With all the millions of photographs out there that a potential audience might view, it’s vital that the first impression grabs the viewer’s attention to draw all possible viewers to your photograph. So site developers, don’t be square and crop your member’s thumbnails; and photographers, think twice about signing up to and posting your photos to sites that are going to unfavourably crop your images.